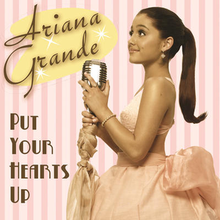 "Put Your Hearts Up" is the debut single by American singer Ariana Grande. She released the single under Republic Records (at the time, Universal Republic Records) on December 12, 2011. The song samples "What's Up?" by 4 Non Blondes. Three years after its release, Grande expressed dissatisfaction with "Put Your Hearts Up", stating that she in fact hated the song and its accompanying music video. She later called it "the worst moment of my life" and "straight out of hell" in a 2014 Rolling Stone interview. Grande began working on her debut album while she was filming Victorious and formally started to work on it with a record label after she was signed to Universal Republic Records on August 10, 2011. By September 10 of that year, Grande already had twenty songs prepared and was going through the process of narrowing it down to thirteen. "Put Your Hearts Up" was written by Matt Squire, Linda Perry, and Martin Johnson. It was released the first single on December 12, 2011. It's a "50s, 60s doo-wop-inspired" bubblegum pop song which talks about making the world a better place.